Retail $49.95 SAVE 16% ! Northwest Logging RR in Skagit Co. It's hard to imagine an area better suited for railroad logging than the park-like pine forests of south-central Oregon, a gently rolling country where railroads could be built with a minimum of cost. 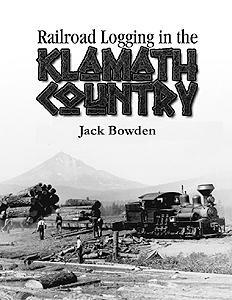 During the first half of the 20th century more than two dozen rail lines were pushed into the forests of Klamath, Deschutes, Lake and Jackson Counties. For over 90 years, companies like Algoma, Pelican Bay, Lamm, Ewana Box, Shaw-Bertram, Kesterson, Wheeler-Olmstead, Brooks-Scanlon, Shevlin-Hicks, Medco, the OC&E and others brought logs out of the woods on their railroads in an attempt to satisfy the nation's insatiable demand for pine lumber and wooden boxes. In addition to over 140 photos, the book contains a concise history of every lumber company in the region that operated a railroad, a roster of its locomotives and one or more maps of its rail lines.